I hope they add another night in Denver. There are a few scattered seats available right now for the 6th, but they are really expensive. I think GA sold out in seconds. If it sells well, they will add a second show--there's room for it in the schedule. Regarding what's left right now, seems to me it's really hard to tell, since they don't have maps like TM does that can show you that. Less than three hours after general sale started and there are multiple GAs on flash seats starting at $174 apiece. Not even trying to pretend any more, huh? Congrats to the fans who managed to snag one. And I'm curious if flash seats GAs can be transferred, unlike the credit card entry ones. $634.50 for two lower level tickets?! I know that is the going price..but wow! The GA's can be transferred. How do you know? They aren't anywhere else (except NY). I got two lower bowl vip for 480 combined it saves about 200 in fees so I'll take it. Members can take advantage still pricey but worth it to me. The fees on all the other tickets are ridiculous though. I'm excited! Because there is a transfer function and in their FAQ it tells you all about what you can do. You can sell them back on their site or transfer them to a friend. I think someone else posted this as well. Oh, OK. Very strange...guess it's because it's a different seller w/different rules. Thanks. Wow--good catch. Not announced on u2.com yet! 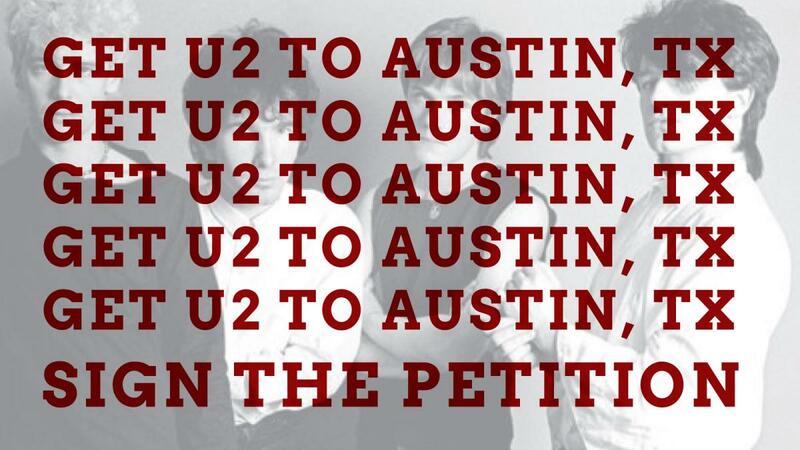 Please sign my friendly petition to get U2 to add Austin, TX to their tour. Really? I'd like them to come & visit me in Sydney, maybe I should start a petition too. Not to advocate the secondary market, but there are GAs for sale on Flash Seats, so for Denver they are transferable. The GAs are Flash Seats tickets (swipe credit card OR scan code on phone app). But the credit card doesn't have to be the original purchaser, the tics can be transferred to another Flash Seats account and then it's the card associated with the transferrees account. As of right now there are a lot of tickets available for the second night in Denver. Interesting. Since it's a different ticket vendor, how can you tell without seeing the 'every seat' maps that TM shows? Because you can still log on and get some really good seats. Its shocking how poorly it has sold. That being said, it hasn't been advertized well at all in the Denver market...not sure why. Yeah, I bought two for June 6, then was looking at other options and saw as was noted that you can buy about the same seats for $200 less if you get the VIP pkg. Wished I had looked at that sooner. May try to resell them through Flashseats. If anyone wants to buy 2 tix Section 120 Row 2 Seats 12-13 contact me. I'd sell them for the same as I bought them for and get something cheaper - like I did for the June 7 show. I see some are selling same seats, same row on Flashseats for $500 each. Crazy!! !